Jewish Louisville – in fact, all of Louisville – is getting its first glimpse of the future J at this hour. The Jewish Community of Louisville, announcing its “Our Community, Our Future” capital campaign to finance construction of the new facility and develop its entire Dutchmans Lane campus, is holding a press conference at the J where artist renderings of the proposed center are being unveiled. They are more than just pretty pictures. JCL officials also are announcing a transformational gift from the Jewish Heritage Fund for Excellence, which puts the capital campaign more than halfway towards its goal. JHFE is allocating $10 million towards the $40 million project cost, plus $15 million in matching funds. Thanks to lead gifts during the quiet phase of the campaign, it has reached 60 percent of its goal. The design phase of the project will be completed this summer. Actual groundbreaking, which is contingent upon fundraising, is slated for the end of the year. The current center will remain open during construction. It will finally be razed within 90-days of the new building’s completion. JCL President & CEO Sara Klein Wagner and Board of Directors President Jon Fleischaker are making the announcement. Representatives from GBBN, the project’s architect, and JHFE also are there. Community is at the press conference and will report additional details as they become the available. The proposed J will be a modern-looking 106,000-square-foot building, with an 80,000-square-foot footprint, and a blue “J” – the center’s new brand name – affixed outside at the main entrance. 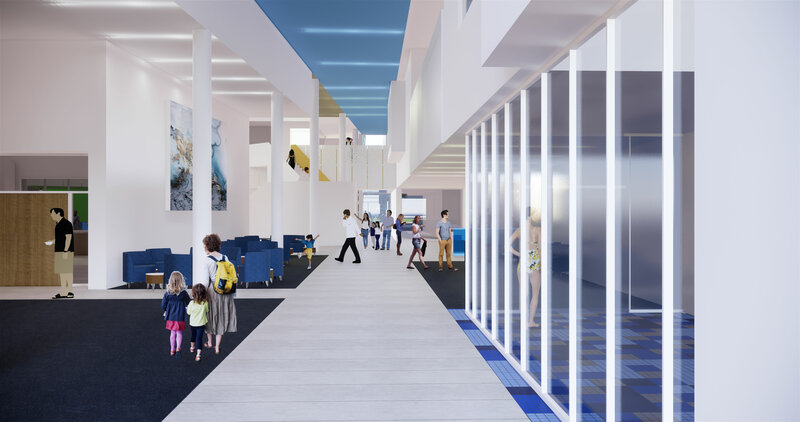 One hallmark feature of the new design is “The Street,” an open air hallway running the length of the building from which users can access all amenities and offices in the J. 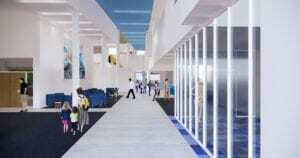 “The Street,” a thoroughfare running the length of the center, connecting visitors to all its amenities, will be a signature feature of the new J. Another component of the project, the acquisition of the Anshei Sfard property, is expected to complete by May. The acquisition will enhance and expand the size of the J campus, and the mikvah – the ritual bath on the property – will be maintained, but the JCL officials have not yet decided how the rest of the property will be used. The J also serves the greater Louisville community as well as the Jewish community. In fact, many of its members are not Jewish. The J also boasts health and wellness facilities, classrooms, a social hall and theater, indoor and outdoor pools, an early learning center, a senior center, athletic fields, playgrounds and a community garden and orchard. "Our Community, Anshei Sfard, Dutchmans Lane campus, J, Our Future"